Nothing defines the flavor of fall like pumpkin. We decided this squash needed a make-over, though. I mean, who isn’t joking about “pumpkin spice” these days? Set the cinnamon aside, friends. Instead, we’d like to offer up… pumpkin spicy. From the usual, we found another direction and added smoked paprika, cumin and adobe sauce, giving a spicy, savory kick to this soup. It’s a great weeknight supper, andcomes together in less than twenty minutes. To save time, use two cans of plain pumpkin and 1 can of drained pinto beans. You’ll find canned chipotles in adobe sauce in the Latin food section of your grocer. 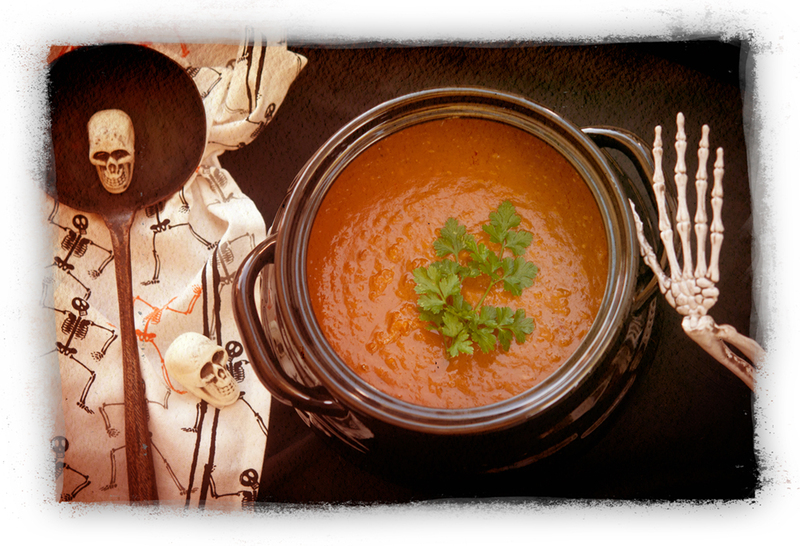 We also recommend this soup as a pre-Trick or Treat meal or something to fortify older ghouls before a Halloween party. As written, this recipe is vegan and gluten-free; it serves 6 to 8 people as a main course. In a large soup pot over medium heat, saute chopped onions and garlic in olive oil or a little vegetable broth, about two to four minutes. Cook, stirring often, until onions are soft and lightly browned. Add onions and garlic to a food processor or strong blender with pinto beans, smoked paprika, adobe sauce, cumin, oregano and salt. Pour in about one cup of vegetable broth. Puree until very smooth, scraping sides of processor or blender bowl to incorporate all ingredients. When smooth, pour mixture into soup pot. Add remaining vegetable broth and pumpkin into soup bowl and stir together. Warm over medium heat until warmed through. Serve warm with fresh parsley on top, if desired.